On the Indian sub-continent mail runners and horse-drawn mail carts conveyed the letters from England, endangered by tigers and the "Thag" robber gangs. In 1852 the 1.676m broad gauge railway Bombay - Thana opened, the first section of the future GIPR on the way to Calcutta. In the '50s the Calcutta mail used certain rail sections via Poona, then Agra. Bombay - Igatpuri was completed in 1865. The Thull Ghat mountain section initially could be crossed regularly only during daylight hours, but for the mail from England an exception was made. That meant the start of special Overland Mail trains, consisting of one or two vans only. From 1866 that "Special Train", including a post-office and extra-fare passenger cars, ran regularly in connection with the mail steamers. 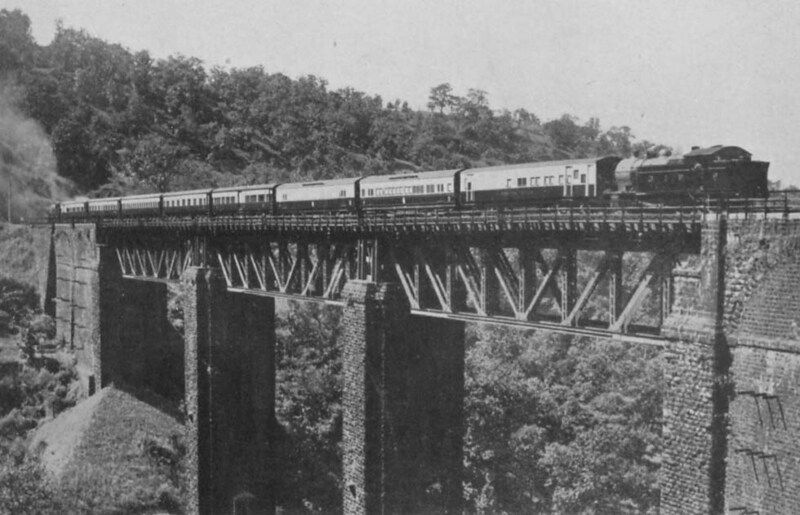 In 1870 the direct rail link Bombay - Jabalpur - Calcutta Howrah was established by GIPR and EIR. In February 1889 started an experimental special Howrah - Bombay with 43 hours traveling time in addition to the regular mail trains. Depending on subsidies by the Postal Department it ended soon. 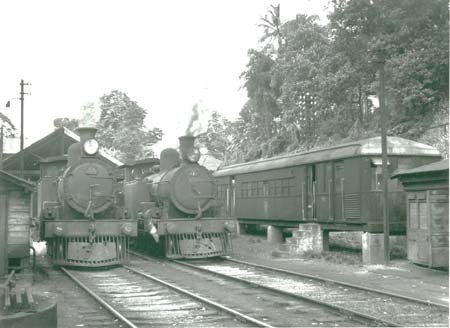 In 1897 first-class through cars from Calcutta Howrah changed in Naini (near Allahabat) to a mail special. 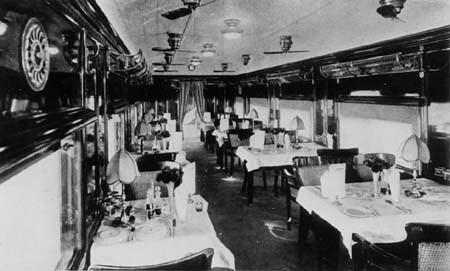 From 1898 or 89 a new white "European Mail Train", consisting of 1st class sleepers, a diner with a longitudinal table and mail cars, jointly owned by GIPR and EIR, provided a new once-weekly service Bombay Victoria - Calcutta Howrah. 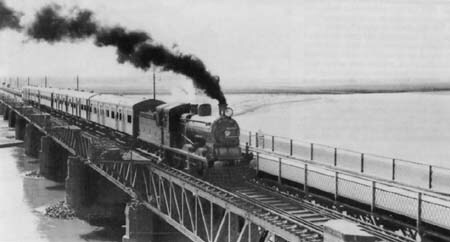 In 1908 a new Overland Express replaced it. With a true bath room for every compartment it was the most luxurious train of the world. 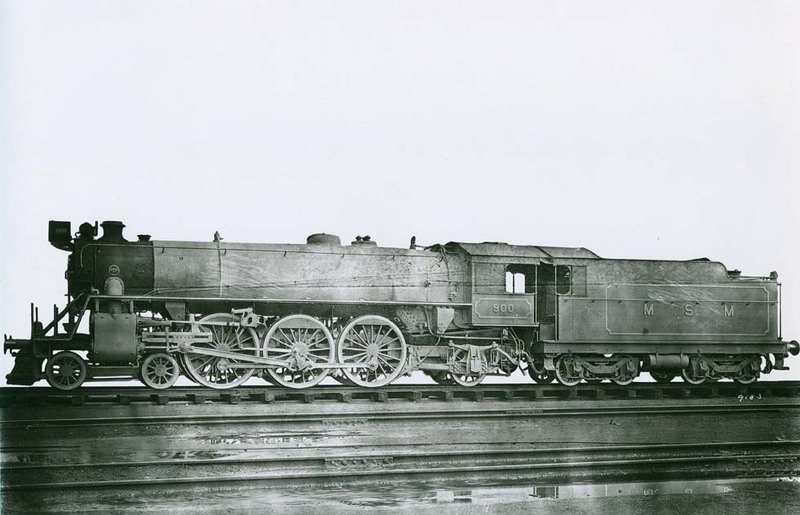 Cook's off 1911 showed 36 hours traveling time for that "Special Limited Express". In 1926 new cars were built for a new "Imperial Indian Mail", one set by GIPR and one by EIR. 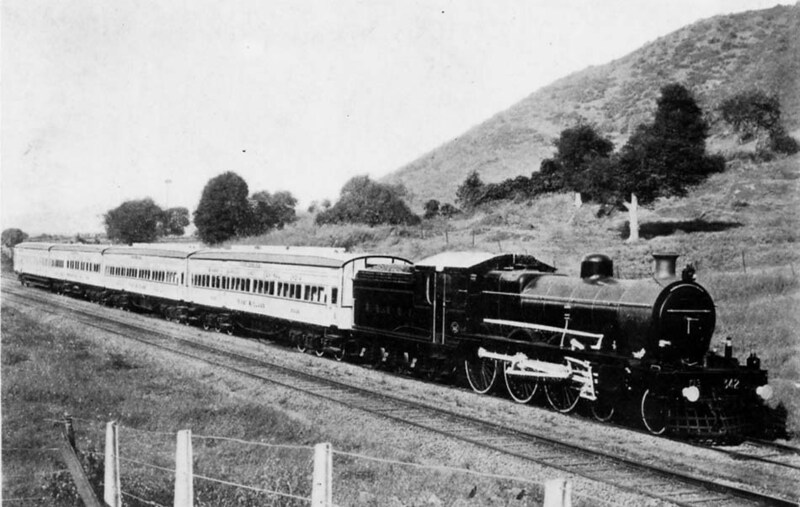 The passengers paid eight times the standard fare and cooperation with the Peninsular & Oriental Steam Navigation Company made the train profitable for the railways. For a holiday trip to Darjeeling the travelers could take the Darjeeling Mail to Siliguri, where they changed to the famous narrow gauge mountain railway. Car No.5 (2 single-compartments, 1 bath, places for servants). Cars 1-5 12-wheelers. 1 or 2 postal vans, 8-wheelers. One train set was from GIPR, painted cream, and another one from EIR, painted dark blue. Traction: Tenwheelers, then on GIPR possibly XA Pacifics. Bombay - Igatpuri electrified with 1.5 kVd.c., completed in 1930, 2Co1 type engines and on the Bhore Ghat CoCo (WCG1, Crocodile type) helpers. Colors: GIPR steam locomotives maroon, electrics at least later black. 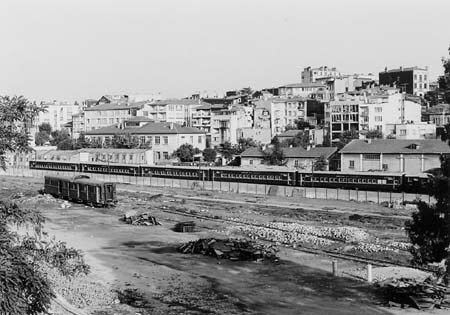 From 1889 a broad gauge line, which then became a part of the GIPR, connected Bombay with Delhi. A competitor became the BBCIR in 1909 on a shorter way via Baroda. From 1912 Delhi was the capital of India and in the same year BBCIR started an exclusive P&O special Bombay - Delhi - Peshawar. The competing GIPR's answer was another "postal" special. 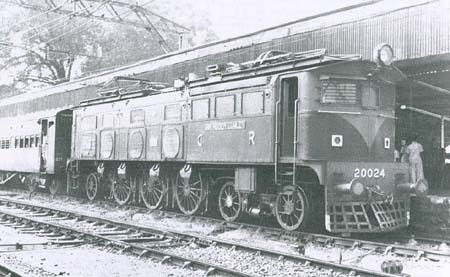 In 1927 both companies introduced new train sets and the "race to Delhi" started. 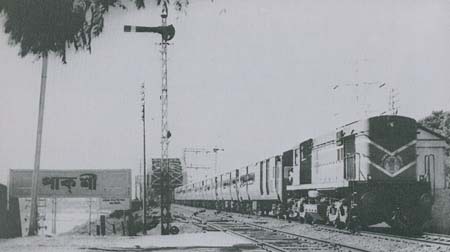 The P&O Punjab Express of the GIPR was victorious, while the Punjab Limited Express of the GIPR had to be closed down due to tremendous losses. All these de-Luxe trains were cream-colored. Traction initially 4-4-0 or 4-4-2 then 4-6-0 type engines. 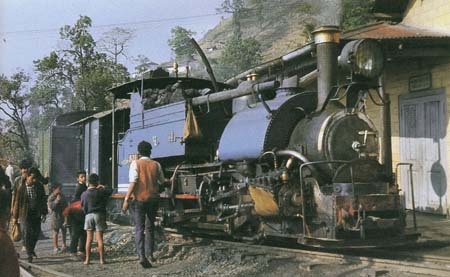 GIPR tank engines on the Thull Ghat near Bombay. 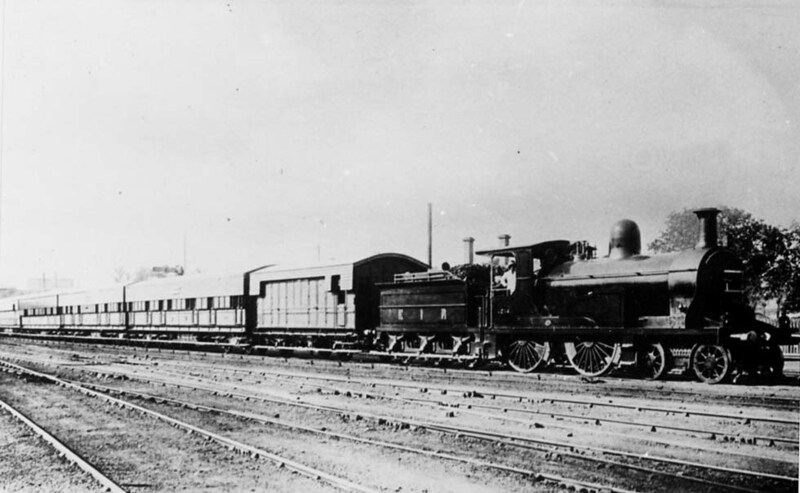 A broad gauge railway Bombay - Madras (now Chennai) via Raichur was completed by GIPR and MR in 1871. A "Special Limited Express" Bombay - Madras however ran only in the first decade of the 20th century. 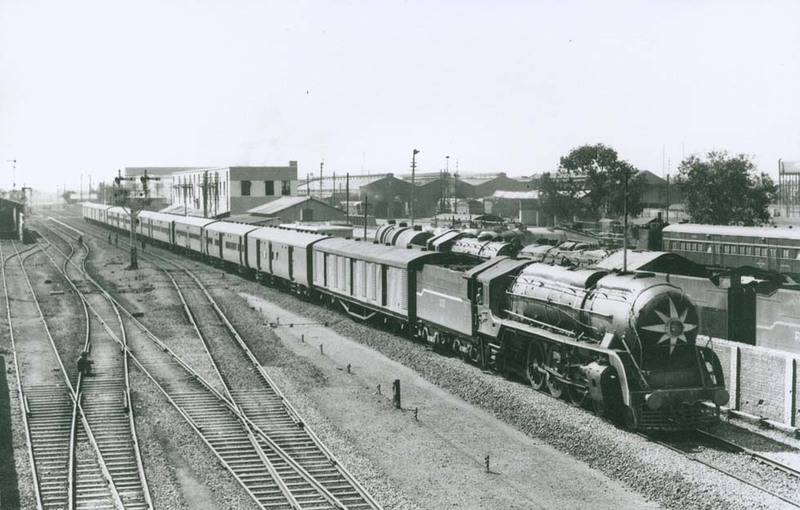 Passengers of the regular Madras Mail could take a meter gauge train of the SIR to Tuticorin and then a British India Liner to Colombo, Sri Lanka. In 1914 a new service was introduced with the meter gauge Ceylon Boat Mail Madras - Dhanushkodi, connecting with steamers to Talaimannar (see www.ships-worldwide) and the broad gauge Ceylon Government Railway to Colombo and further on. In 1947 India got rid of British dominance, but hostility between Hindu and Muslim caused the country to be split-up into India and Pakistan � against the intention of Mahatma Gandhi. Refugees aboard trains were killed and the Pakistan border was closed. The Imperial Indian Mail and other exclusive expresses had disappeared long before. Repeatedly there were Indo-Pakistan wars, mainly for the province of Kashmir. During the decades of the superpowers� Cold War, India stayed neutral and though it never was communist, the Soviet Union was targeted to become its important partner in economy and military supply. 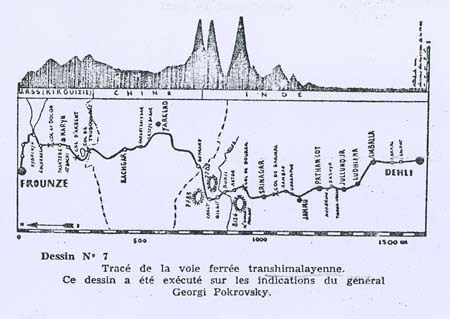 There were rumors about Soviet intentions to establish a 4.5m-gauge Trans Himalaya rail connection between the USSR and India, equipped with nuclear-powered steam engines, described by Lucien Barnier in his book �A quoi revent les savants sovietiques� (Paris, 1958): A line from Rybachiy near Frunze (now Bishkek, the capital of Kyrgyzstan) should cross the border of China on the Touboucart Pass, at Kashi it would have got a rail connection with Urumqi, the Karakoroum would have been crossed west of Mount K2 and the line would continue via Gilgit, Astor and Srinagar to Jammu Tawi, now the terminus of Indian Railways. 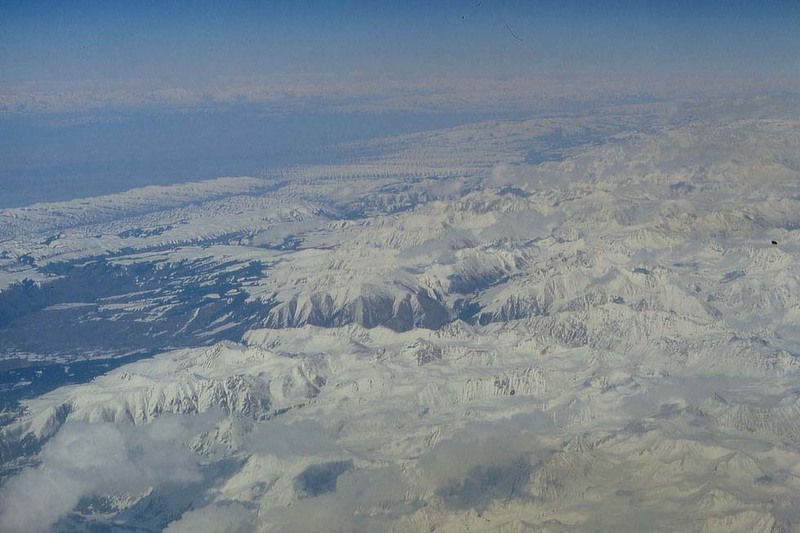 The armistice line between Pakistan and India would have been crossed on the Burzil Pass, east of the Nanga Parbat. Could it mean that this Kashmir region had been supposed to be conquered by India for establishing this link with the Soviet Union? In the USSR however a true project of a 4.5m-gauge did not exist, as Henschel engineer Professor Kademann had learned during his contact with Soviet officials. 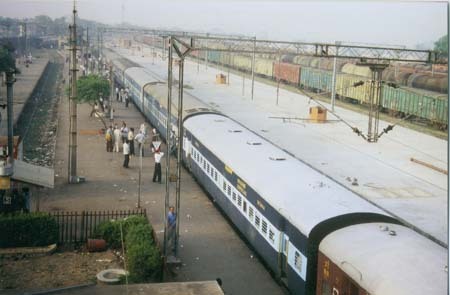 A multitude of conventional long-distance trains connect all the big cities of India, nowadays like in the past. 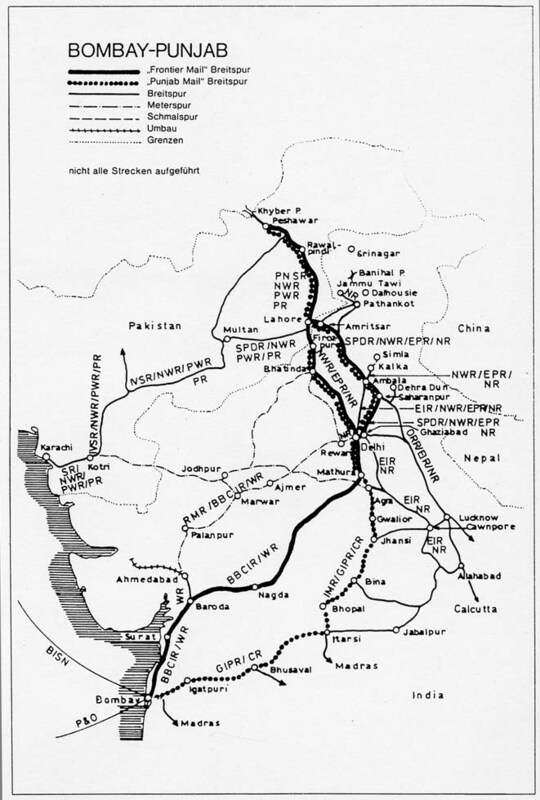 In the utmost north-east, the meter-gauge Assam-Bengal Railway had been converted to broad gauge and its terminus Dibrugarh was connected with Delhi by the �Brahmaputra Mail� and the �Rajdhani Express�, of course circumventing Bangladesh. Now a train Lahore � Amritsar crosses the border between Pakistan and India. At the end of the 20th century an important new line, the coastal railway Mumbai (Bombay) - Mangalore was completed. In India the traditional expresses with annually c. 500 billion passenger kilometers and with 24 cars per train are a necessity still for a while. A quite different modern logistics project open to private investment is the idea of special corridors for container transport crossing the country. 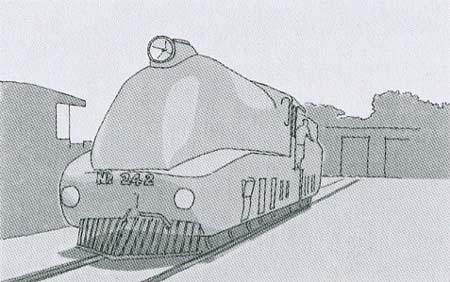 Nevertheless also the possibility of future high-speed trains became envisioned. In 2011 the Indian state Kerala ordered studying a high-speed line in the region of Mangalore, also other studies for lines with 200km/h were mentioned and high-speed dreams Delhi � Mumbai were rumored. In 2012 Railway Gazette Intl mentioned standard-gauge high-speed studies Pune � Mumbai � Ahmedabad and Aerospace America (Feb. 2012) reported that planning six high-speed railways included also Kolkata (Calcutta) � Howrah � Haldia, Delhi � Patna and a link across the south. Also in Pakistan high-speed studies emerged � see the chapter Trans-Asia within the main chapter Mideast. 1 2nd class & Mail Bombay - Firozepur "
Traction: WCM4 (d.c.) Bombay-Igatpuri, WCG2 (d.c.) helper Kasara - Igatpuri, WCM5 (a.c.) or diesel from Igatpuri, diesel WDM2 (CoCo) to Jhansi. WP (4-6-2 steam!) Jhansi - Delhi (photograph see chapter Travels). Colors: Electric and diesel locomotives maroon, WP green/black cars maroon/cream. The de-Luxe special Deccan Odyssey started round trips between Mumbai (Bombay), Goa and Aurangabad. 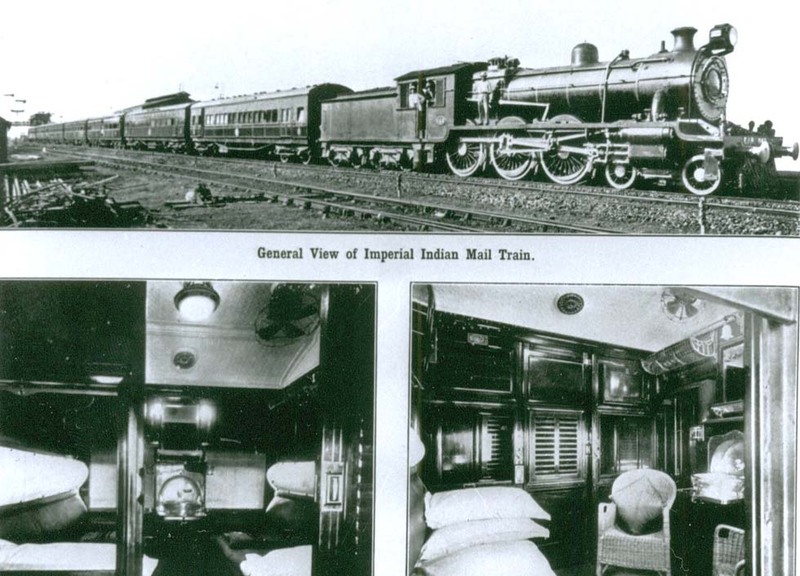 On India's meter-gauge the white nostalgic "Maharadja Express" de-Luxe special had been introduced for trips Delhi - Udaipur - Jaipur - Delhi, later "The Palace on Wheels" and the "Royal Orient Express" for Delhi - Veraval round trips. 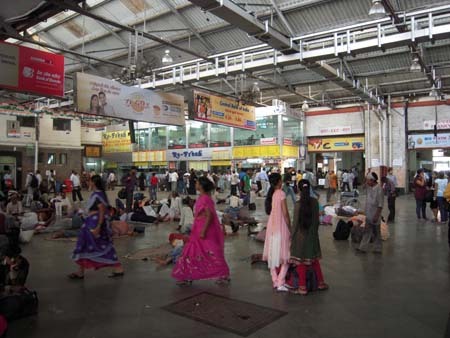 In 2010 a luxury cruise train �Maharajas� Express� started at Kolkata. With the war of 1971 East Pakistan was cut off from Pakistan, becoming the state Bangladesh. 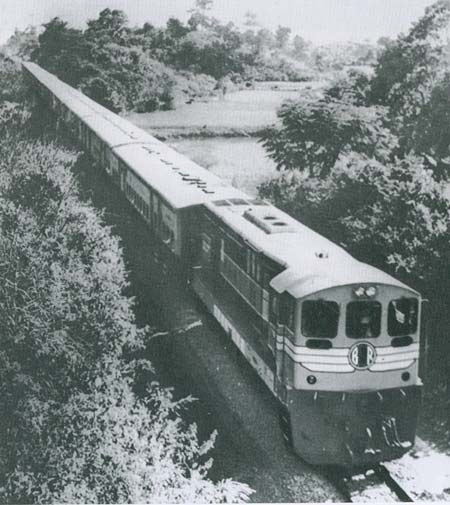 Through traffic from Kolkata to Bangladesh was closed already in 1965 and resumed in 2008, one train set being provided by Indian Railways, consisting of coaches and couchettes (blue/pastel) and another one by Bangladesh Railways, running on 1.676m broad gauge. Cook�s Overseas Timetable registered it on the route Kolkata Chitpur � Dhaka Cantonment, Gede and Darsana being the border stations. 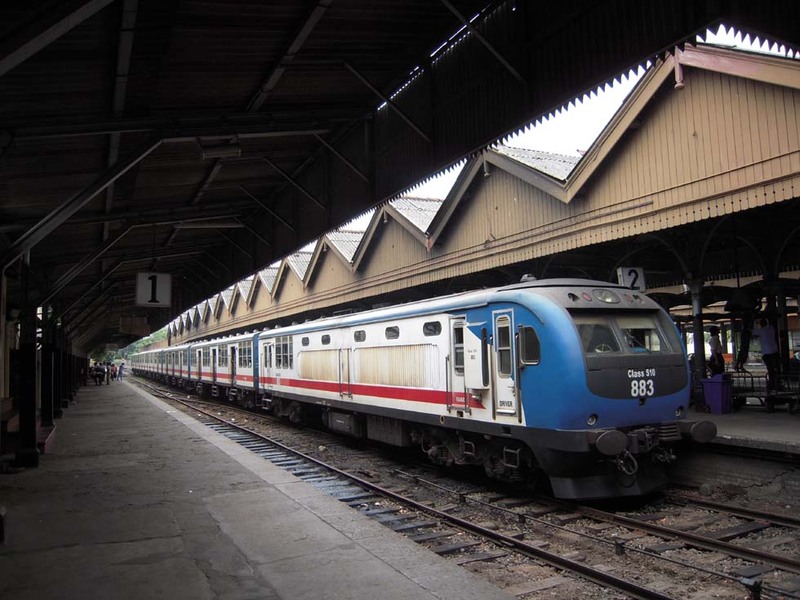 River ferries are completing the rail network and east of the capital Dhaka it consists of meter gauge. The project of an extension to Ukhia close to the border of Myanmar was reported, but no train appeared in Cook�s timetable. Ceylon was liberated in 1948, renamed Sri Lanka in 1972. The Indo-Ceylon Boat Mail was hit in 1965, when its Dhanushkodi Pier in India was destroyed by a hurricane. 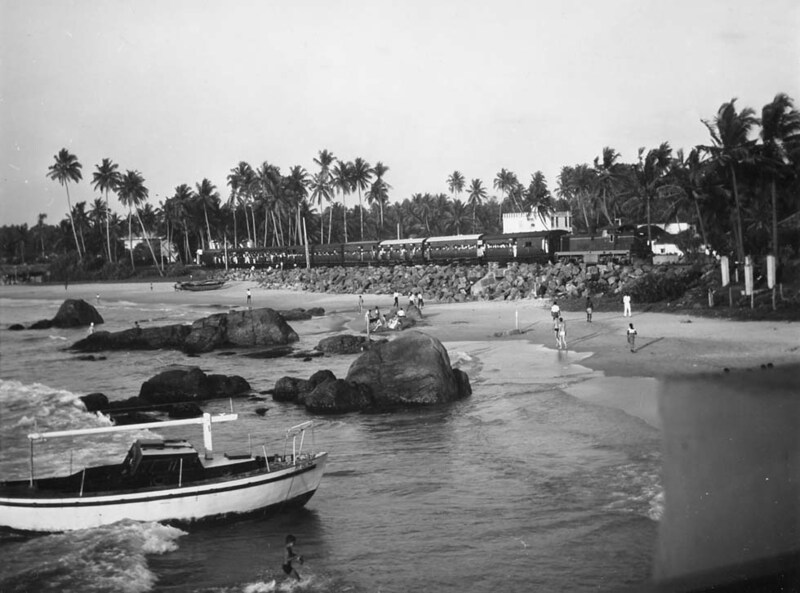 Then the traditional ferry service connected only nearby Rameswaram with Talaimannar Pier, where the train for Colombo waited, equipped also with a sleeping-car. In 1983 the ethnic conflict with the Tamiles escalated and soon Cook's Overseas Timetable informed about the route of the Shipping Corporation of India: Services suspended indefinitely. Talaimannar had still to wait for getting its train to Colombo and Vavuniya was the northern terminal for the trains. 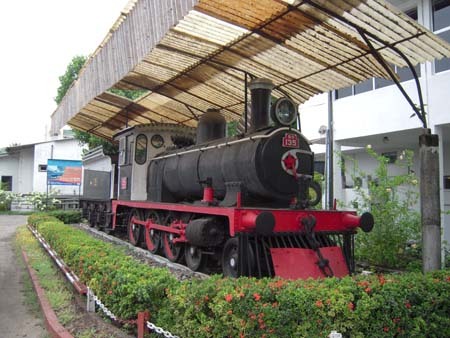 In 2009 the Tamiles, whose conflict has caused more than 100,000 victims, were defeated, The Sri Lanka Government Railway is continuing domestic services on 1.676m broad gauge. 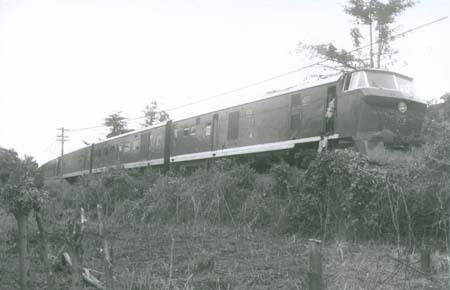 Modern diesel railcars were delivered in the 70s from Japan, intended also as an airport link, and still in the 21st century one was seen on the Galle route. The S10 was built in China and the newest railcar set S11 in India. The worst catastrophe with more than 1,000 victims has occurred on December 26, 2004, when the Tsunami wave hit a passenger train, hauled by a diesel engine M2A from Canada, on the coastal line Colombo - Galle. Only half a year later Kalatara - Galle was to be re-opened (for more information see the report by Johannes Gloeckner in Eisenbahn-Kurier 6/2012). In Colombo the hi-speed car ferry "Jetliner" could be watched, during the conflict used for humanitarian operation, then for mini-cruises, and in April 2012 a harbour police officer informed the author that it has opened regular services to Ramaswaram in India (see www.ships-worldwide.com).